It was finally time for the Qaggiq to celebrate of the sun’s return to Igloolik, an event postponed in January 1997 for several days due to the death of a young man who overdosed on drugs. 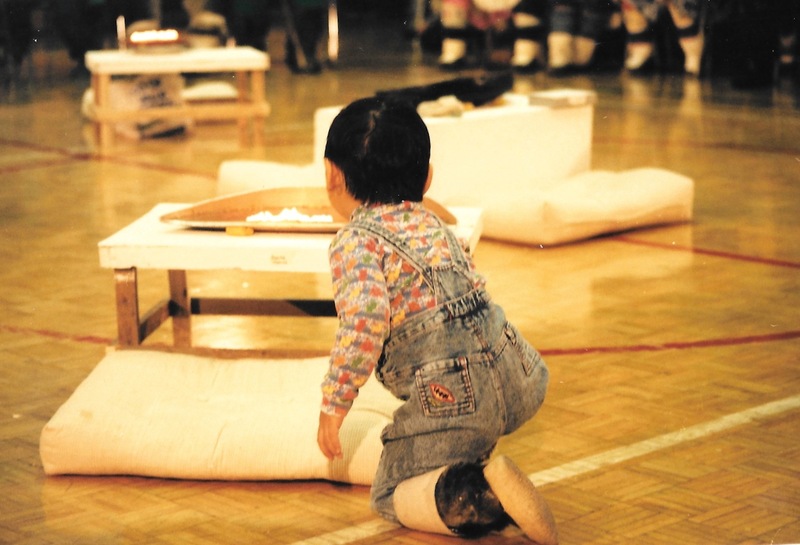 When the Qaggiq took place, nearly everyone in the community of about 1,200 gathered in the local gym — not the huge igloo of former times — to welcome back the sun with dancing, singing and Inuit games which continued for hours. 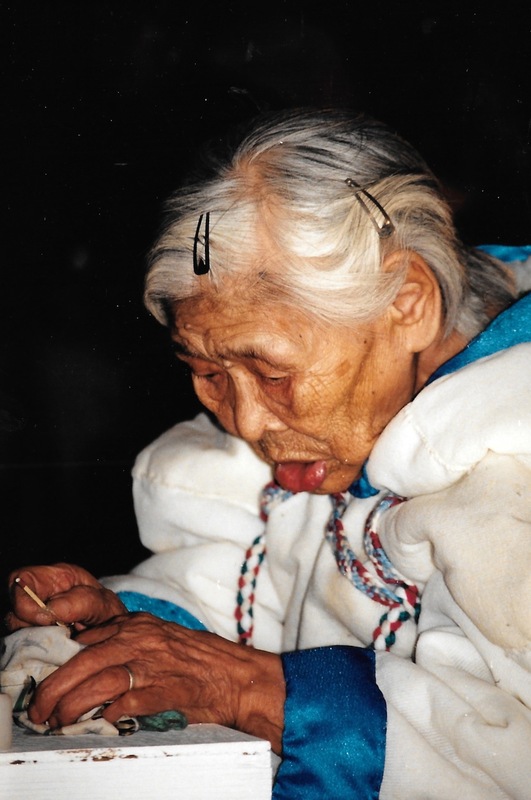 The oldest resident of Igloolik, then 91-year old Rosie Iqallijuq, tended the wick of a soapstone lamp, the qulliq, set in the middle of a circle of similar lamps. From this central flame, a young girl relit the other qulliit lamps, celebrating the rebirth of light and hope. However, camera flashes interfered with the proceedings: while the elders’ feast at the Igloolik Research Centre I attended earlier in the week was calm, this was event is almost a media brawl. Of course, I was also trying to get good shots. Television cameras almost completely obscured the lighting of the qulliit: Those present would have to check later in the local newspaper or watch television to see what took place. “With brighter days being back, we hope the light will be brighter in the future,” Lazarus Arreak of the Baffin Regional Inuit Association told the gathering. The suicide statistics in the mid-1990s were bleak enough (although even 15 years later, these do not improve): There were an average of 22 suicides a year in the eastern Arctic, which then had a population of about 24,000. Most were young Inuit men aged 14 to 24. Firearms and hanging were the most common methods. Drugs, alcohol and substance abuse were often involved. “We hope that alcohol and drugs will continue to do no more damage to our communities,” said Arreak, who would go on to suffer problems of his own — he resigned from his position in 1998 — and in 2000 pleads guilty to one count of sexual assault, while two other charges against him involving the sexual molestation of underage girls were dropped. 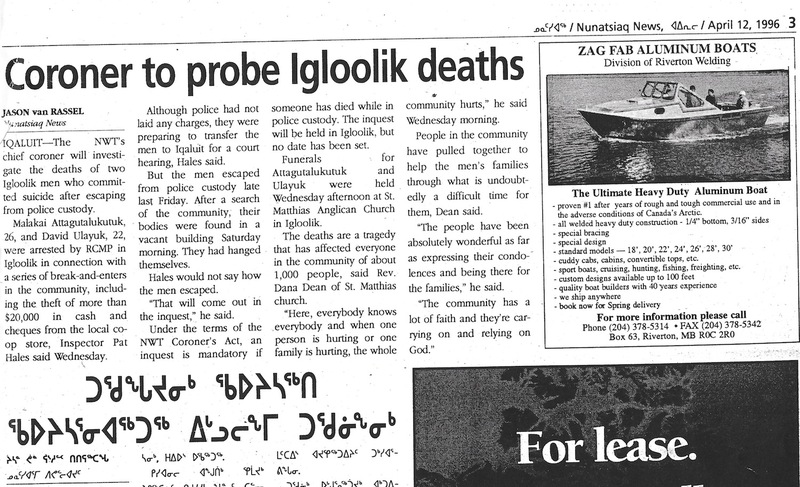 Some months before my visit to Igloolik in 1997, two men in their 20s had hanged themselves after escaping police custody, in a suicide pact that shocked the community. A Nunatsiaq News clipping about two men who die in police custody in Igloolik in 1996. While in Igloolik, I pieced together their story: the two had been arrested and were being held in conjunction with a series of break-ins and thefts, including the theft of more than $20,000 from the community’s co-operative store. After plugging up the small jail’s toilet, they convinced a guard to let them out to use the RCMP office facilities. They ran off, taking guns and ammunition with them, to make a desperate last stand. But the bullets didn’t match their guns. So, they killed themselves instead. People in Igloolik told me that, for a long time, the presence of older Inuit provided a bulwark against change. Back in 1820, explorer William Parry noted that Inuit in this region lived together in harmony. Honesty, openness and co-operation, he noted, were the hallmarks of their small-scale society. But social peace was no longer the rule: Things were worse than before, I was told, because of the ever-increasing number of young people more influenced by television and videos than traditional values. For years, Igloolik banned television from the community, until 1983 when Inuktitut-language broadcasts became available. In 1997, television from around North America was available on cable and local stores carried recent video releases. At the same time, discipline among students was becoming difficult to maintain, and several teachers had decided to leave the community or taken sick leave, one as the result of a young student’s assault. “Traditional values are very important to us,” said Louis Tapardjuk (later an MLA and minister in the Nunavut government), who has spearheaded the recording oral histories in Igloolik for the Inuullarit Society’s oral history project. Ataguttaaluk, who died in 1948 at 75, was a woman who personified these traditional Inuit values for the residents of Igloolik. When she and her family were caught out on the land in a fierce storm, she survived by eating the frozen flesh of her husband and children after they died. Her determination to survive and her honesty about the experience made Ataguttaaluk a local hero: Igloolik’s school bears her name today. But material survival was no longer an issue, and the community, despite its reputation as the tradition-bearer of Inuit ways, appeared to be in the middle of a battle with new problems. Violence related to alcohol consumption was high, according to RCMP officers at the Igloolik detachment. Petty theft and other property offences was also on the increase and drug use had increased, they said. “Nunavut will help,” I heard from one resident, expressing a commonly-held hope about the creation of the new territory in 1999. But in January 1997, April 1, 1999 seemed far away to me while I struggled with Igloolik’s frigid temperatures, the darkness, and I felt haunted by the sight of huge, dog-sized ravens flying around the cemetery. I found out garbage in the new dump nearby that nourished the ravens. 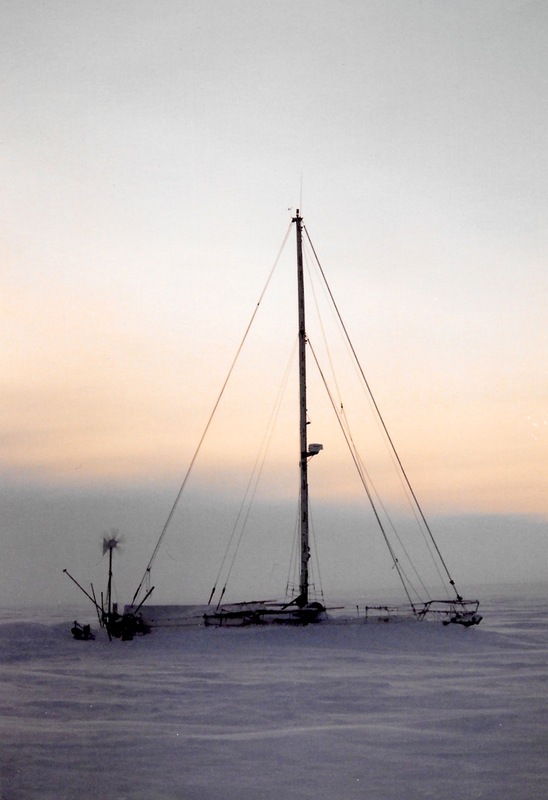 My goal on that frigid trip across the sea ice, along with some CBC television reporters: to interview a French couple who was living on their tiny yacht frozen in the ice about 20 minutes from Igloolik. There they ate lukewarm meals in their cold galley. The couple’s on-board experiences and menus become fodder for a humorous piece on life in the cold for CBC’s Basic Black, then a popular national radio show. But I didn’t feel as if life was funny while in I was in Igloolik. I was annoyed that my mastery of Inuktitut wasn’t good enough yet for me to interview unilingual elders: I was limited to only polite exchanges in Inuktitut and listening to conversations. And I was alarmed by the resident non-Inuit I meet in the community. Why were they there? They all complained of rising social problems in Igloolik and about the high levels of violence and despair in the community. Most appeared to be just hanging on, until they could leave. Or, if they couldn’t or didn’t want to leave, they apparently had made a pact to accept the situation. At the time, it made me feel that they were part of the community’s problems, collaborating through their inaction, and keeping secrets, too. There was a woman in her 60s, whom I met — Georgia, who ended up in Igloolik and wrote a book in 1982 called An Arctic Diary about her experiences over the course of a year in Igloolik and Repulse Bay. This image of Georgia is from the eponymous book that she wrote about her life in the North. In 1997, Georgia lived in a tiny house by the water, which, when I visited, was covered in ice and snow. In the summer, however, she had a “bone garden” in front of her house and I could see some whale bones sticking out through the snow. 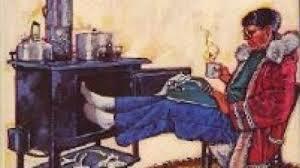 Inside her house, where boiling water steamed up from the stove, there was a huge polar bear hide tacked on to a wall. Georgia suggested off-hand that I could stay in her house some day when she was out of Igloolik. But I was terrified by her generous offer and this otherwise pleasant encounter over tea — and I decided then that, no matter what would happen later on in my life, I would not end up alone in a dark, cold community again in January, far from my family. Read more from the Like an iceberg’s “Qaggiq,” a four-part series, May 7. Miss the first part of “Qaggiq”? Find it here.